Figure 1. Nanny-kid nursery group in mid-summer near the Herbert Glacier, the location where John Schoen and others conducted the first mountain goat research study in southeastern Alaska (1977-1982). Mountain goats are among the least studied large mammals in North America, yet the Alaska Department of Fish and Game has made substantial progress in understanding this iconic species through efforts initiated by dedicated Alaska wildlife biologists beginning in the early-1960s. Shortly after statehood, the Alaska Department of Fish and Game formalized efforts to gather baseline information about mountain goat population size, composition, distribution, and trends in various areas throughout the state by conducting aerial surveys via fixed-wing aircraft. While not technically research studies, these survey and inventory efforts represented the beginning of formalized data collection on the species by the Alaska Department of Fish and Game. By the early-1970s biologists recognized a need to more carefully refine aerial survey techniques in order to increase the precision of survey results and more accurately monitor population trends. In the mid-1970s, research biologists Lyman Nichols and Warren Ballard initiated studies oriented towards fine-tuning aerial survey techniques by understanding factors that influence the number of animals seen during a given aerial survey. These studies, conducted on the Kenai Peninsula and in Southeast Alaska, resulted in several important recommendations for optimizing aerial survey efforts and provided a more rigorous basis for interpreting aerial survey data. In the late-1970s and early-1980s, mountain goat management issues became increasingly focused on habitat selection requirements and movement patterns of the species. This occurred because of the tendency of mountain goats to winter in steep, forested, low-elevation sites in coastal areas; areas subject to habitat alteration via clear cut logging. A concurrent concern related to defining sub-population boundaries in order to properly delineate hunt area boundaries. For example, it was unclear whether local populations might be subject to over-harvest since the area used by demographically independent populations was not well understood. To address these issues, research biologists Lyman Nichols (Kenai Peninsula) and John Schoen, Christian Smith and Kris Hundertmark (Southeast Alaska – Juneau, Ketchikan and Kelsall areas, respectively) initiated the first research studies in Alaska involving the attachment of VHF radio-telemetry collars to mountain goats (a revolutionary new technology at the time). These studies also pioneered new techniques for capturing mountain goats, involving darting animals (with veterinary immobilizing agents) from a helicopter, a particularly difficult but efficient method that is still routinely used today. The results of these studies provided critical, new information about many aspects of mountain goat habitat selection and movement patterns. Specifically, data revealed that mountain goats seasonally migrate from alpine summer range to low elevation winter ranges in coastal sites, but in interior sites winter at high elevations. Further, studies indicated that mountain goats have high fidelity to specific summer and winter ranges. Data were also used to develop mountain goat habitat models and used to map critical winter habitats. Such products have been widely used for land management planning by the U.S. Forest Service (the primary land owner in most of Alaskan mountain goat range) and further assisted wildlife management biologists in designing sustainable mountain goat harvest strategies. In the early-1990’s, research efforts were initiated to monitor the effects of industrial timber harvest and mining on mountain goats. In the Prince William Sound area, Herman Griese and Bill Taylor initiated a study to characterize mountain goat winter range use in an area proposed for timber harvest. 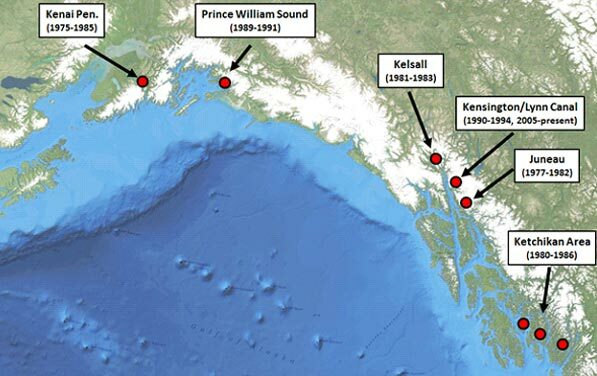 In the Juneau area, Tom McCarthy and Matt Robus initiated mountain goat radio-marking and monitoring efforts to gather baseline data from local sites proposed for mining development (AJ and Kensington mines). Following a 10 year hiatus, the Alaska Department of Fish and Game initiated a new generation of mountain goat studies in 2005. In response to proposed highway construction (i.e. Juneau Access project) and re-development of the Kensington Mine, a new mountain goat project was initiated by research biologist Kevin White in the eastern Lynn Canal area. This project utilized an exciting new innovation in wildlife research - radio-collars tracked by Global Positioning Satellites (GPS). This technology enabled the collection of mountain goat location information at 6-hr intervals at a high degree of accuracy. Using new, innovative statistical methods (resource selection function models) these data were analyzed to provide more descriptive and statistically rigorous delineation of mountain goat critical habitat than had been previously possible. Further dimensions of the study involved estimating mountain goat vital rates (i.e. reproduction and survival), population size, composition and trends, movement patterns, diet composition, population genetics, and disease status. The results from this study have been used for making management recommendations and serve as an important baseline for comparative studies of mountain goat ecology throughout Alaska and North America. The initial phase of this project was completed in 2012 yet certain aspects of the study are still ongoing. 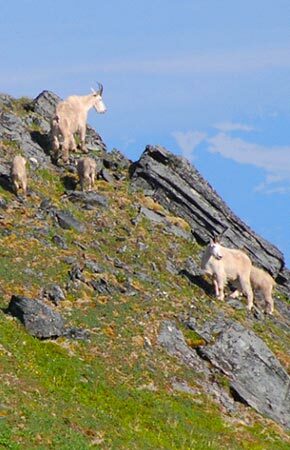 Since 2009, several other mountain goat research projects have been initiated in coastal Alaska and are ongoing. Detailed information about these projects can be accessed by following the links on this website. In addition, a list of publications associated with the historical mountain goat research projects described above can be found by accessing the “ADF&G mountain goat research bibliography” webpage. Figure 1. Location of historical ADFG mountain goat research studies.